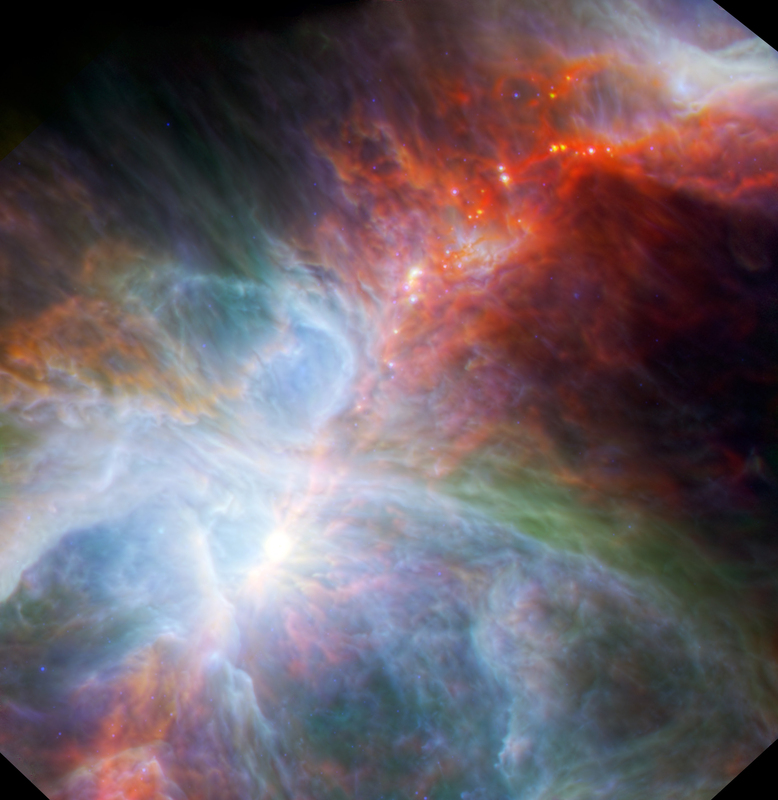 A gorgeous new image from the tag team effort of the Herschel and Spitzer Space telescopes shows a rainbow of colors within the Orion nebula. The different colors reflect the different wavelengths of infrared light captured by the two space observatories, and by combining their observations, astronomers can get a more complete picture of star formation. And in fact, astronomers have spotted young stars in the Orion nebula changing right before their eyes, over a span of just a few weeks! Astronomers with Herschel mapped this region of the sky once a week for six weeks in the late winter and spring of 2011. Notice the necklace of stars strung across the middle of the image? Over just that short amount of time, a discernible change in the stars took place as they appeared to be rapidly heating up and cooling down. The astronomers wondered if the stars were actually maturing from being star embryos, moving towards becoming full-fledged stars. To monitor for activity in protostars, Herschel’s Photodetector Array Camera and Spectrometer stared in long infrared wavelengths of light, tracing cold dust particles, while Spitzer took a look at the warmer dust emitting shorter infrared wavelengths. In this data, astronomers noticed that several of the young stars varied in their brightness by more than 20 percent over just a few weeks. As this twinkling comes from cool material emitting infrared light, the material must be far from the hot center of the young star, likely in the outer disk or surrounding gas envelope. At that distance, it should take years or centuries for material to spiral closer in to the growing starlet, rather than mere weeks. The astronomers said a couple of scenarios could account for this short span. One possibility is that lumpy filaments of gas funnel from the outer to the central regions of the star, temporarily warming the object as the clumps hit its inner disk. Or, it could be that material occasionally piles up at the inner edge of the disk and casts a shadow on the outer disk. Now that’s cool! Or um…hot. If you click the picture, you get the full-size picture. This has been true of every picture on UT. My suggestion makes sense, simply because UT gets the pictures from somewhere, so WHY NOT publish the original source link??? Actually it seems like this is the full-res picture – absolutely huge! So yes it seems I was wrong. Well, it’s not about being right or wrong, but making sure you’re not before posting, which does not always work, haha.